Dogs Trump History 2006, NOT! were removed, restoring Fort Washington to its approximate original 1859 appearance. The City of Cambridge, did the Right thing, Thank you. Mr. Rudolph's 70 year Journey, from an Immigrant Lad to an American Patriot, sums up the American Experience, in that he is a Brother, of the Patriotic Band of Brothers, that Washington spoke of, that, through the generations, have defended the freedom of the United States of America, and that are honored here at Fort Washington. As Mr. Rudolph said, "Fort Washington is a symbol and a vision, a reminder of what we are, where we came from", and what we can do," and thanks to Mr. Rudolph, Fort Washington, a Symbol of American freedom, is not just another parking lot. 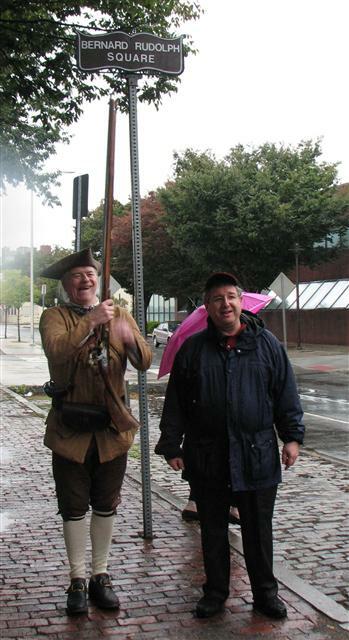 Stuart Rudolph, son of Fort Washington Protector, Bernard Rudolph - with Gardner's Regiment == Charlestown Militia Company, attended the Fort Washington Rededication Ceremony. In a letter to Joseph Reed dated November 27, 1775, George Washington, wrote, "I have caused two half Moon Batterries to be thrown up for occasional use, between Litchmore's more's Point and the mouth of Cambridge River;" (Charles River) . Of the many siege fortifications built, only the Three Gun Battery Earthworks at Fort Washington Park survive in an original condition. After, the Battle of Bunker Hill on June 17th 1775, Volunteer soldiers, worked for 9 months building dozens of siege fortifications, in a Ring, around Boston. Henry Knox’s volunteer soldiers and teamsters, hauled Heavy Siege Cannons, from Fort Ticonderoga, New York, 300 miles, to Cambridge Common. Four Thousand (4000) American Soldiers placed them on Dorchester Heights on the night of March 4th 1776, forcing the British evacuation of Boston on March 17, 1776. The British never did return and on March 17th, we celebrate Evacuation Day / St. Patrick’s Day, and Washington’s First Victory. from the close of the Revolution till 1857, when it was deeded to the city by the following persons: Edmund T. and Elizabeth Hastings, Mary E. Dana, Joseph A. and Penelope Willard, John and Hannah B. Bartlett. A fund of $800 was also turned over to the city, by these people who cared for this plot of historic land. The conditions named in the deed were as follows: "that the above premises when suitably enclosed and adorned by said city, shall forever remain open for light, air, and adornment, for the convenience and accommodation of the owners of estates in said Pine Grove, and of the Public generally." The city accepted this gift and with the assistance of the Commonwealth of Massachusetts proceeded to restore this battery to its original condition, to build a substantial fence around it and to erect a flagstaff. The secretary of war gave three Eighteen Pound American guns, and the Secretary of the Navy gave the gun carriages. The state legislature voted to appropriate the sum of $2000. "provided the city of Cambridge shall appropriate a sum sufficient to complete the said fence at a cost of not less than four thousand dollars and said Fort Washington shall always be accessible to the public, and that said city shall always keep the fence proposed to built, in good repair." The Cambridge City Directory 1861 reported the Earthworks to be five years old in appearance and in excellent condition and the total cost was $9,504.05. other like Businesses gave the Cambridgeport Neighborhood the nickname of "Greasy Village". The Charles River Tidal "Oyster Flats" on the south side of Fort Washington were filled, creating new land, isolating Fort Washington a ¼ mile from the Charles River. Thus, Fort Washington became a place avoided and was vandalized. 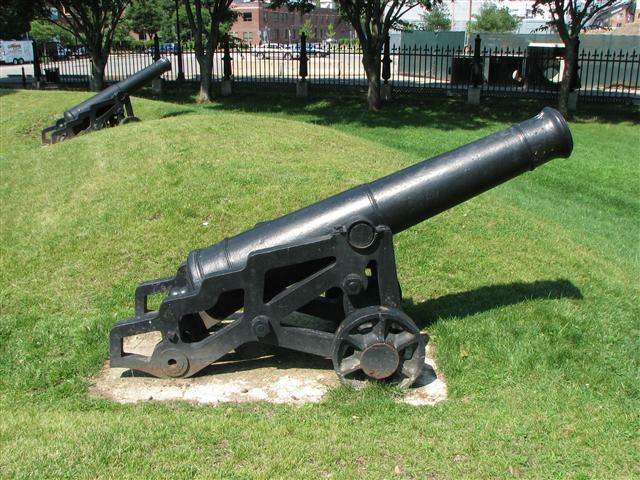 The Hannah Winthrop Chapter Daughters of the American Revolution restored Fort Washington in 1905, and quoted, History of Cambridge, Massachusetts 1630-1877, Lucius R. Paige "Let no unpatriotic hand destroy this revolutionary relic, now known as Fort Washington." in their book HISTORIC GUIDE TO CAMBRIDGE-1907. Bernard Rudolph (Bernie), arrived in Cambridgeport in 1921 at age 10, escaping Russian persecution with his mother, Rose and sisters, joining his Father, Hymie who emigrated here earlier. Of Cambridgeport’ Bernie said, "from the aroma of fat-rendering then in the area. On a hot day, when the smell mixed with that coming from chocolate factory, the mixture boggled the senses." Bernard Rudolph (Bernie) grew up in Cambridgeport, served in WWII and returned to Cambridgeport with his Wife Marion and raised a Son, Stuart and daughters, Sandra and Lois. He became president of Cambridge Post 35 Jewish War Veterans. By the Early 1960’s Fort Washington had become fully enclosed by defunct St. Johnsbury Trucking Company. Bernie witnessed Fort Washington’s decline over many years saying "During the Depression, people ripped sections off the fence to sell to junkyards. Through the years, it suffered from a bad case of neglect. "The flagpole, the cannon, the fence, and the mounds [of earthworks] showed that no one cared," he said, "If commercial and political allies had prevailed then, the fort would be a parking lot today." His goal, Mr. Rudolph said, was "just and simple: That this historic fort should not become another dump for snow in the winter and a parking lot for trailers in the summer." Before the 1960s, before Mr. Rudolph launched his campaign to save the park around 1967, the fact that it was generally ignored, bothered him. In 1968, with the help of his wife, Marion K. Rudolph, they organized raffles and other events and raised $1075 dollars for the installation of a new flagpole at the park. Bernie Rudolph and his son Stuart, would raise the flag every morning and lower it every evening, for five years, flying flags procured by Tip O'Neill, the late speaker of the House who represented this neighborhood, until, Bernie got the city and the utility company to put lighting in so the flag could be displayed around the clock. Ceremonies held at Fort Washington, on Flag Day, June 14th, were attended by the Late Senator, Ted Kennedy, Attorney General, Elliot Richardson and veteran organizations. Fort Washington was listed on the U.S. National Register of Historic Places in 1973. By 1975, with interest aroused by the bicentennial, Mr. Rudolph's diligence finally paid off. Mr. Rudolph gained allies like the DAR, and M.I.T. Professor, Douglas Adams. The Cast Iron Fence was eventually restored to it’s approximate 1859 appearance at a cost of over $400,000, much of it Bicentennial and National Park Funds. Archeology studies confirmed the Revolutionary Earthworks are "original and fragile". In the Cambridge City Directory, 1861, the author wishes a Statue of Colonel Richard C. Gridley, who probably designed the Three Gun Battery, adorn the site. 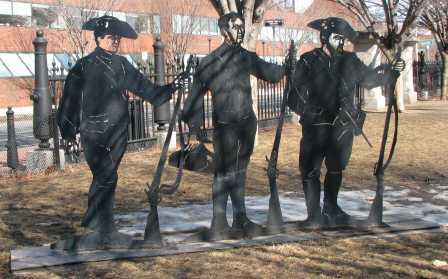 The Madeline Lord Relief Sculptures, of Common Soldiers, modeled on Re-enactors, represent the Spirit of the over 16,000 American Soldiers that took part in the "Siege of Boston", better, than the likeness of an individual. These are a welcome reminder of who this Park honors. On October, 11th, 1998, in recognition of his efforts, the Cambridge City Council named the Fort Washington Area Bernard Rudolph Square. At the ceremony, Mr. Rudolph spoke affectionately about his Wife, Marion "my chief aide, my greatest critic and my biggest supporter." Those at the ceremony said it was typically Bernie to mention all the people who helped him his effort to save Fort Washington Park, including his "pro bono attorney Eddy Applestein," Cambridge Post 35 Jewish War Veterans, and the late Pasquale Reale, director of veterans' services for Cambridge, and his four grandchildren and daughter-in-law. Mr. Rudolph's 70 year Journey, from an Immigrant Lad to an American Patriot, sums up the American Experience in that he is a Brother of the Patriotic Band of Brothers that Washington spoke of. That through the generations have defended the freedom of the United States of America, that are honored here at Fort Washington. As Mr. Rudolph said "Fort Washington is a symbol and a vision, a reminder of what we are, where we came from", and what we can do," and thanks to Mr. Rudolph, Fort Washington, a Symbol of American freedom, is not just another parking lot. Gardner's Regiment == Charlestown Militia Company, attended the Fort Washington Rededication Ceremony 2009-10-03. Pvt. Andrew Brown and Lt. Mike Bonislawski proudly display the Gardner's Regiment banner on Cambridge Common.